Summary: Learn how to lay a block paving path or driveway. To construct a path or driveways using paving stones successfully, you must prepare the job thoroughly and not cut any corners. Your path will need to perform to the right standards in order for it to be used properly and to last a long time. You will want to make sure that during wet weather, the water can run off the pathway and away from the direction of the house (if your house connects to the path). Your path will also need to have a secure and firm edge as this is the most vulnerable part of any paving. Before you start, try and get hold of a block splitter. This will make cutting bricks a lot more accurate, not to mention quicker. Start by marking out the shape of the path using wooden pegs and string. When you are sure of the size and direction of the path, excavate to a depth of one brick you are using, plus 50mm (2in). You will be laying a 50mm bed of sand. 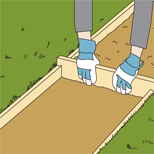 Now create a wooden edging using lengths of timber planks. Securely screw these to pegs inserted into the ground behind the edging planks. The timber should be treated. 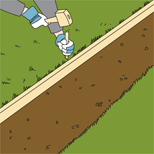 Compress the soil using a rammer. Spread sharp sand over the excavated area. Spread the sand evenly over the length of the path. Do this by cutting a length of timber that is the width of the path and fits exactly between the sides, then drag the timber piece down the pathway. This will spread the sand out evenly. 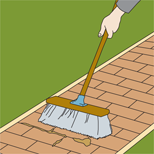 Make sure the paving stones sit flush with the edging boards. Do this by using a single stone and checking along the length of the path to see if it sits correctly. Make any necessary adjustments to the level of the sand as you go. Lay out the blocks in the pattern of your choice. Make sure they are butted close together. Then fit the blocks that needed to be cut-to-size into the spaces available. Bed the laid out path by knocking them in with a rubber mallet. Check the surface of the path is even using a spirit level. 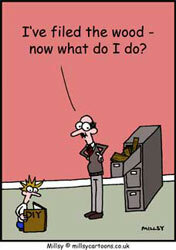 Any areas that are not even will need to be adjusted. Do this by lifting the necessary blocks and re-levelling the sand. Now you need to fill the spaces between the paving stones by spreading kiln dried sand over the path. This will cover all the gaps and joints. 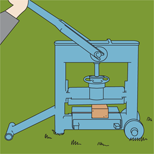 Compact the paving blocks more thoroughly using a compacting plate. This will secure the blocks. Sweep over the blocks after this is finished. Try to sweep the sand into the joints. Leave the path for 3-4 days to settle. If more sand is required after this time, then give the path another spreading of the same kiln dried sand and brush like before. Using a rubber mallet place wooden pegs in the ground and attach treated timber. Using a battan, spread and level sharp sand into the excavated area. Cut your paving bricks to size using a block splitter. Sweep kiln dried sand between the paving blocks.